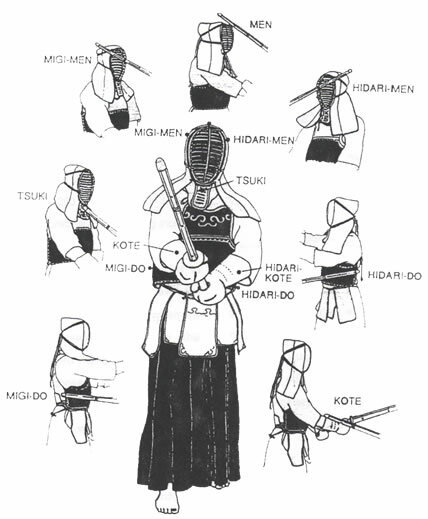 There are four designated target areas in Kendo, each worth one point in a match. There are strikes to the head (MEN), the wrist (KOTE), the body (DO) and a thrust to the throat (TSUKI). Competitors call their targets in a strong voice (KIAI) as they strike. Blows must be delivered with clarity and precision using the outer third of the bamboo SHINAI. The referees look for good form and a strong follow through that leaves a player in a position to continue immediately with no letup of spirit. There are many ways to hit these four point areas. Shikake-waza – Offensive waza. Shikake means “challenge”. Shikake-waza include the Harai, Debane and Hiki wazas. Oji-waza – Countering waza. Oji-waza is the name given to “defensive” and counterattacking techniques such as Nuki, Suriage and Kaeshi wazas. Harai Waza (deflecting): Offensive waza where a strike is made after deflecting an opponent’s shinai, thus breaking the opponent’s kamae. Nuki Waza (avoiding): A waza where you avoid your opponent’s attack causing them to swing through the air then counterattack when your opponent’s waza has ended. Debana Waza (thwarting): A waza that is performed just as an opponent intends to deliver a strike.